It is completely wonderful having my mom in town. Mom visits are the best, I get to show off my favorite restaurants, get spoiled during trips to the mall (but more importantly, Costco! ), and have someone who knows me through and through to chat with at the end of each day. Over the weekend we drove out to The Coffee Shop, for brunch, coffees & treats. I love that having visitors in town gives you an excuse to go to all of the places you don't go regularly, especially when it includes a 30 minute drive in each direction. But yet again, this place is so worth it! As usual, the restaurant was packed. Thankfully, good food is always worth waiting for in my book, so we patiently waited in the massive line while pondering what deliciousness to order. We barely narrowed it down by the time the cashier was looking at me with a crazy eye for not belting my order the second her previous customer had turned to walk away. Pressure! The whoopies. My favorite thing The Coffee Shop offers, which I am so determined to uncover the secret on how to bake them. Last visit left me drooling for days thinking about the strawberry whoopie, but this coconut whoopie? This will go down in history as the best coffee shop treat I've ever.ever.tasted. The San Diegan made a second appearance. After looking over the massive menu, my mom and I both approached each other to split the same item (quite serendipitous). Great name, especially due to my recent frequent trips to SD, and amazing ingredients. 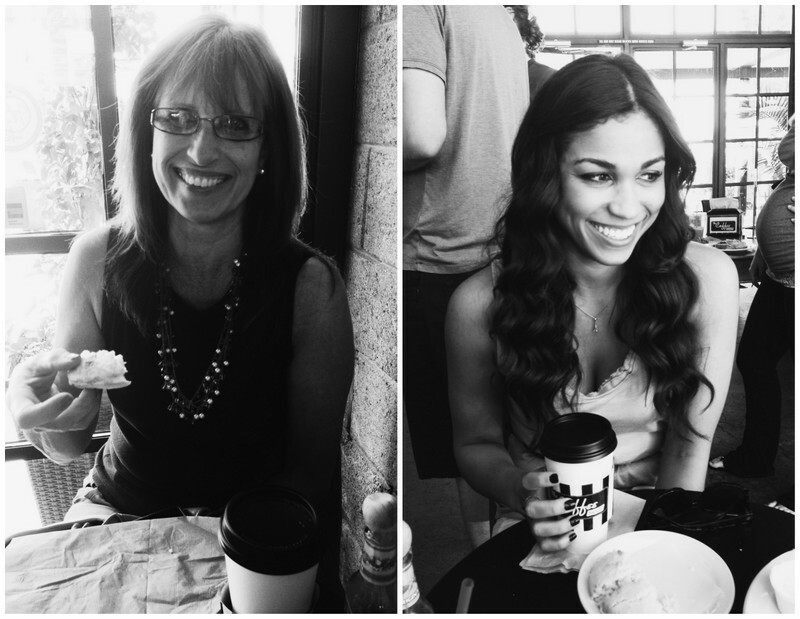 Between that, a hot & iced cinnamon coffee and the glorious whoopie, we left with smiles on our faces. Nothing like late, lazy Sunday brunching with your mama. There is nothing better then having your Mom in town! I love when my Mom comes to visit because it gives me a reason to have a party (allowing her to show off her cooking skills!) and of course the great bonding time you get! Cute pictures, you two look alike!